As from June 15th 2015 I shall no longer be taking orders for my bathroom items from this site. there will be a slight lull in production and then all online orders or enquiries should be made direct to sales@dollshousedirect.co.uk when Gary and his team will be taking over production and sales as from the above date. He will continue to strive for the quality and standards that I have always aimed for during the past 6 years - always with the discerning collector in mind. In the meantime I would like to thank all my loyal customers that have purchased their items from my bathroom collection. The support and all your lovely comments have always been very much appreciated. 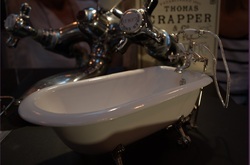 Introducing my range of 12th scale Victorian bathroom fittings. I hope you will find time to stay and browse for a while, and maybe even find that little something that you need to finish a special project. All my items are available on line (except when stated) and secure payment can be made through PayPal. "One of a kind" creations - ideas for projects etc. I hope you will find time to drop by again when maybe my site will be becoming a little more interesting and exciting. In the meantime, thank you for calling by and also I hope you will enjoy your visit. I look forward to welcoming you again. Also if you have any comments, or an enquiry, please feel free to email me.